5/16/2017Share this story on Facebook! The students in Ithaca College's Martin Luther King Scholarship Program travel to a city for a week. This past winter break, they traveled to Havana, Cuba. You can read about their experience here, in a story by Gabriella LoBue. I always asked the same question on my college tours: “what are your study abroad options?” Traveling has been important to me my entire life, and I assumed I’d spend at least a semester in a foreign country on an exchange program. That plan didn’t work out when I decided at the very end of my sophomore year that I wanted to change my major from speech-language pathology and audiology to communication management and design. I no longer had the flexibility to spend a semester away if I wanted to graduate in four years. I was okay with that, but that didn’t mean that I stopped looking for opportunities to travel. When I heard there was a short-term study abroad trip to explore arts and culture in Cuba during spring break, I jumped at the chance. 1. Politics and history are everywhere. 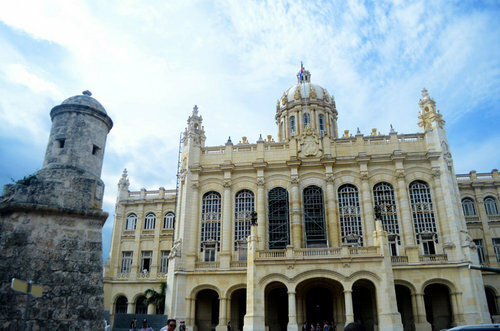 My favorite day of the trip included visiting the Museo de la Revolución, which is housed in the former Presidential Palace where Fulgencio Batista lived and worked in the ‘50s as the dictator of Cuba. On March 13, 1957, student revolutionaries attacked Batista in this building, and it felt surreal to see the original bullet holes that still line the walls of the marble entryway of the museum and imagine that day in history. But the history of Cuba also lives beyond its museums. 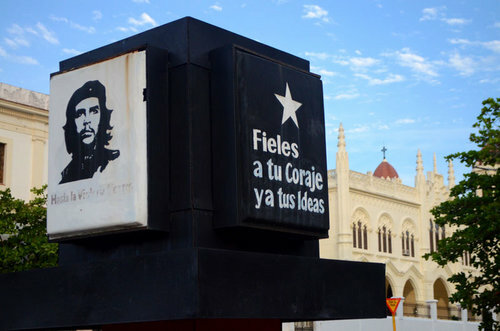 Buildings and cars with very straight lines and minimal decorations are remnants of Cuba’s connection to the Soviet Union, Che Guevara’s face watches you from the government buildings on the Plaza, and you can still donate money to Fidel Castro’s agrarian reform program. When the political structure is reflected on every street corner, you can’t help but get swept up in a distinct Cuban pride. 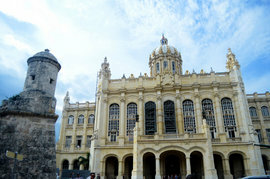 El Museo de la Revolución served as the Presidential Palace from 1920-1959 before the students’ attack on Fulgencio Batista. 2. You can learn a lot from the locals. One of the main reasons I wanted to go on the Cuba trip was to use my Spanish. I declared Spanish as a minor during my first year, but changing majors at the last minute meant I had to give it up. Despite how rusty I’ve gotten in four semesters of not practicing the language, I was excited to have enough of a foundation in Spanish that I could get by in Cuba without too much difficulty. We stayed in casa particulares, a mix between a homestay and a bed-and-breakfast where you live and eat with local families. My roommates couldn’t speak much Spanish beyond “como estás?” and our host mom knew the same amount in English, leaving me to play translator. I asked where to buy water, if the electricity was the correct voltage, and what she did for work. I was surprised to learn how much Cubans admire Castro. Coming from the U.S., we’re taught to only see the ills of his administration, but I talked to Cubans who prioritized the value of socialism. That perspective is one you won’t find as easily in American history books. We lost a lot in translation, but not nearly as much as we would have by speaking only English. 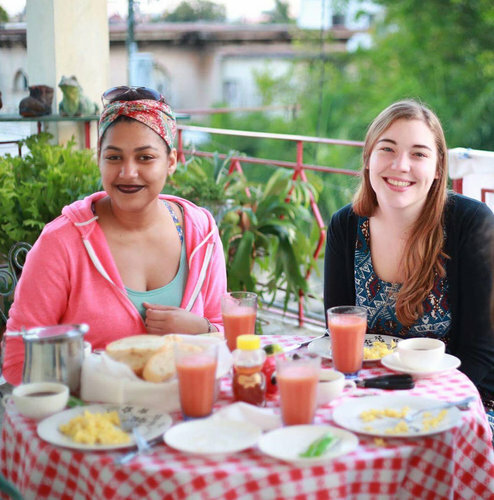 Breakfast with our host mom included scrambled eggs, pan tostado (crispy bread), papaya juice, and tea. 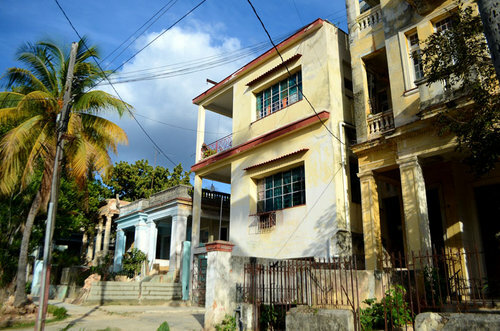 We stayed on the third floor of this yellow house in Vedado, a quiet neighborhood in Havana. 3. Cities look better in color. Havana is by far the most colorful city I’ve visited. 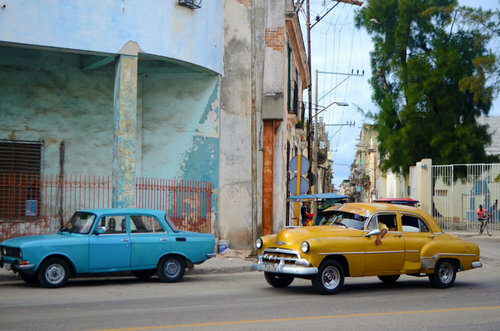 Cars range from lime green to bright purple, the house across from mine was turquoise with a red door, and the baby pink Hotel Ambos Mundos in Old Havana seems calm amid the yellows and blues that line the street. Once you’ve seen such a colorful cityscape, don’t be surprised if it’s hard to go back to buildings in grey, brown, and off-white. The bright blue ETECSA was easy to find, even on a street filled with lots of other colors. Soviet-era cars seem especially linear when sharing the street with classic American models from before the embargo. Okay, I sorta knew this one before I went, but I was reminded just how important art is to me. I’ve always liked exploring galleries and finding street art down back alleys, but I truly fell in love with how political and provocative the Cuban style is. 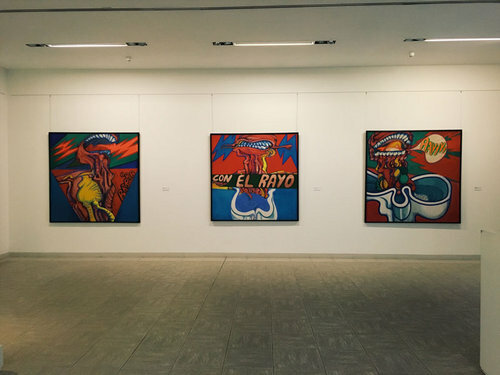 From Raúl Martinez’s pop art style to Manuel Mendive’s surrealism, the spirit of revolution shone through each piece in the Museo de Bellas Artes (Museum of Fine Arts) and left me to yearning to create. Umberto Peña creates images of body parts using gigantism to convey a political message. 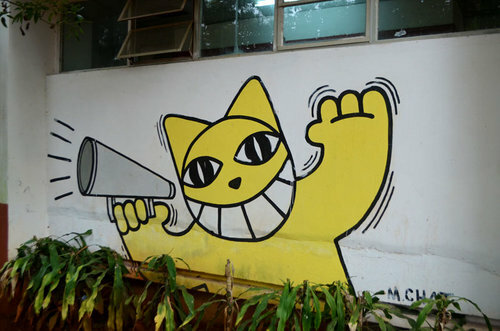 This character from Cuban street artist M. Chat appears all over Havana. 5. You can survive (and even come to enjoy) not having your usual luxuries. Getting WiFi in Cuba is a process. 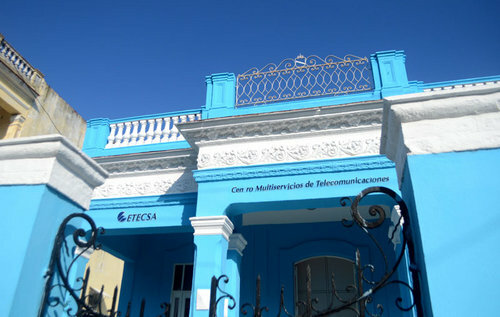 You have to go to an ETECSA (the national telecommunications service), stand in line to visit a teller, register your passport, pay $1.50 per 1-hour Internet card, then find a hotel and sit in the lobby and hope that it’ll connect. Don’t even bother opening Snapchat—it doesn’t work. I spent exactly one hour on WiFi in nine days’ time. I’ll admit it was weird at first to not be in contact with anything going on back home, but it was also extremely liberating to be away from social media and have to live truly in the present. Sure, I didn’t have a warm shower all week and toilet paper was often unavailable, but you learn how to be patient and roll with whatever is thrown at you. Ten years from now I’ll remember taking salsa class with Cuban teenagers, rumba music constantly bumping in the background, and eating croquettes before every meal—not carrying hand sanitizer in my bag to compensate for the lack of soap or replying to emails a week late. 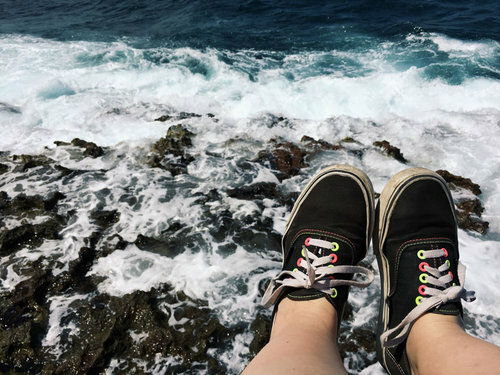 I spent our trip’s breaks relaxing on the malecón to breathe in the sun and salt water.